I cannot remember how many times I have been asked this in order to fill an uncomfortable silence. While to some people this may be a trivial question, I actually think it is quite useful. Often it is changed by adding how many things you bring to this desert island but the premise is the same. I am not planning to travel to an isolated island anytime soon, however it triggers me to remember the little things in life we cannot live without. Most people have one or a list of things they cannot live without. I am not talking about the basic tools for survival but the ones that make life actually worth living. On first though I immediately think, Internet. Yes, I am direct copy of the 21st century child, Gen Y, whatever you want to call it. I am not ashamed that I am addicted to the net and for those who say they can live without it; you are all lying. Your phone, news, radio, television and social networking; all controlled by the Internet. Even print media is going viral and with Internet shopping, established there is no limit to where the Internet can go. As I continue to think, my one thing I really could not live without is my family and friends (O.k. this is technically two things but hey, this is my question) They are people who make your life. Life would not be as good if you did not have your friends to gossip with, consult with your father about problems, bond with your siblings or share that quiet moment in the morning with your mum before you carry on with your busy day. At times, they will irritate you or leave you disappointed but nobody is perfect. That is why you love them for their quirks, habits and mannerisms. I recently have spoken about my need to master the basic recipes of kitchen. This is a landmark moment for me because I made a meringue cookie from scratch without it going brown! Before my meringues had an unattractive shade of pale brown, this did not meet my expectations of the bakery ones. A few key things to remember with meringues. Get yourself an electric oven, any kind of flame makes it harder to get the egg dry without browning. Next, set the oven low, low, low. 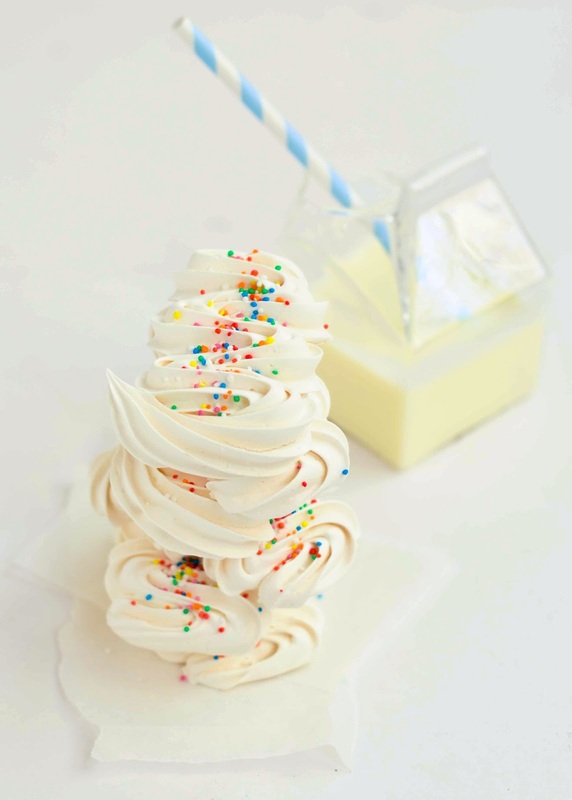 Finally, use the Italian meringue, not the French style. I do not know why this is better maybe the cooked egg meringue is more colour stable? EDIT: Also!!! If you have a large baking tray on hand. 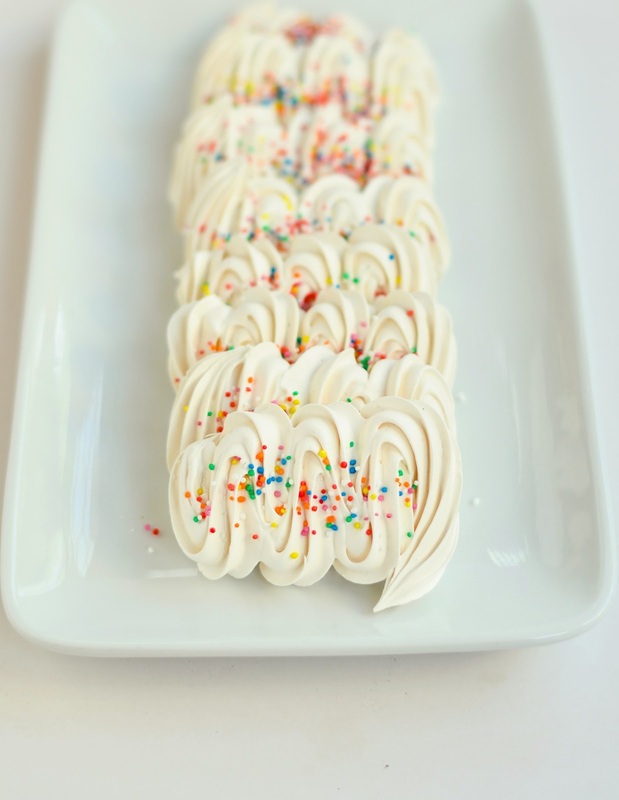 Place the tray on wire rack directly above your meringue tray. This acts as a cover against the element if you have an electric top and bottom oven. If you grow up in Australia, these are just like ones you get in bakeries. Piped in a shape of an S with colourful sprinkles on the top make the perfect childhood treats. Sometimes they come in pink or blue too. 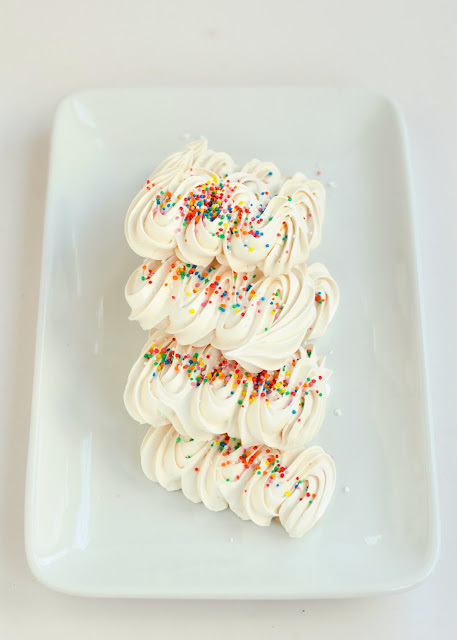 Maybe this Easter if you are sick of all the chocolate bunnies and eggs, you can try some sweet meringues. Great base for ice cream sandwiches or crumbled on to some fresh fruit and cream. Happy Easter Peeps! Share something sweet with your family and friends this holiday. Makes about 30 15cm by 5cm rectangle cookies. Pre heat oven to 125 degrees C.
In a saucepan, combine the water and caster sugar. Stir. Place in your candy thermometer. Set over low heat and DO NOT STIR. Shaking the pan helps gets the sugar off the sides or a wet pastry brush. 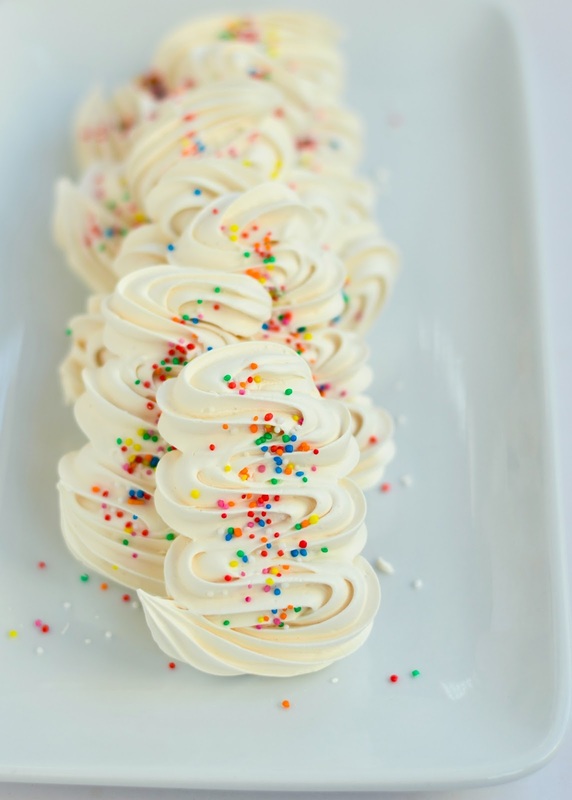 Continue to cook until it reaches 115 degrees C.
IN a stand mixer place your egg whites, and beat until soft peaks. Once the syrup reaches 121 degrees, remove from heat. While this is happening, prepare two trays with baking paper. In a piping bag with large star tip, spoon your meringue into it. Pipe your desired shape and bake for 90 minutes or until hollow when the base is tapped. Wow! 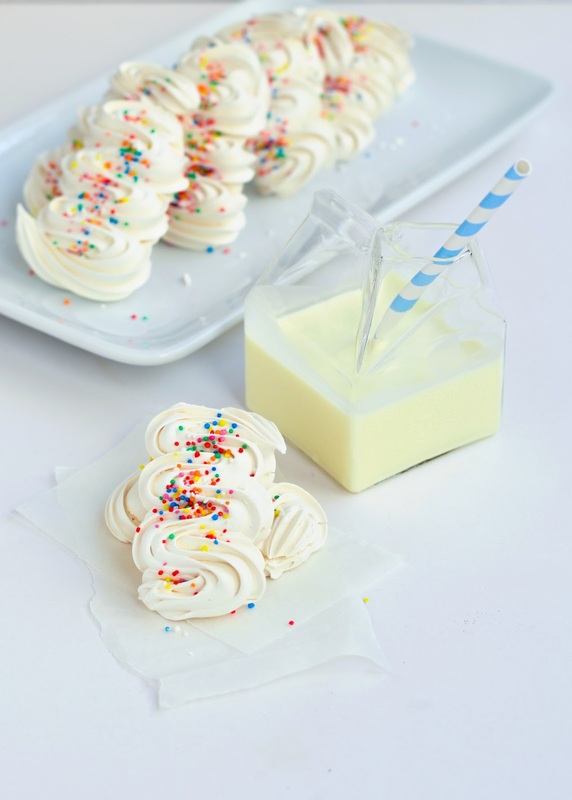 These look incredibly pretty – like little sprinkle covered clouds! 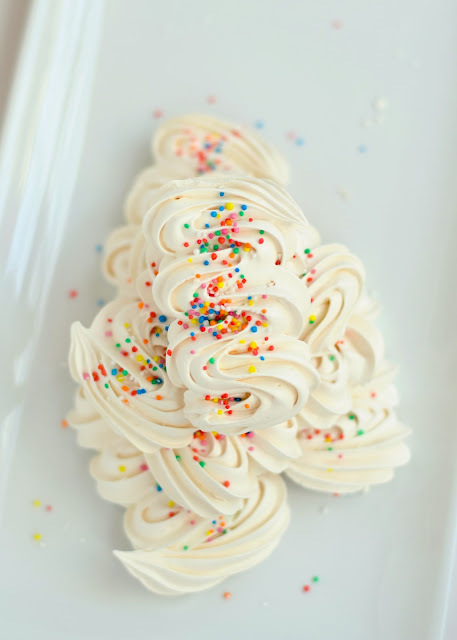 Thanks Sydney, meringues always look so angelic and simple to do. BAKE FOR AN HOUR AND A HALF? OR FOR HALF AN HOUR? THEY DO LOOK AMAZING BY THE WAY!! Thanks susan, one hour and a half, so that would be 90 mintues. Sorry I should of used mintues. 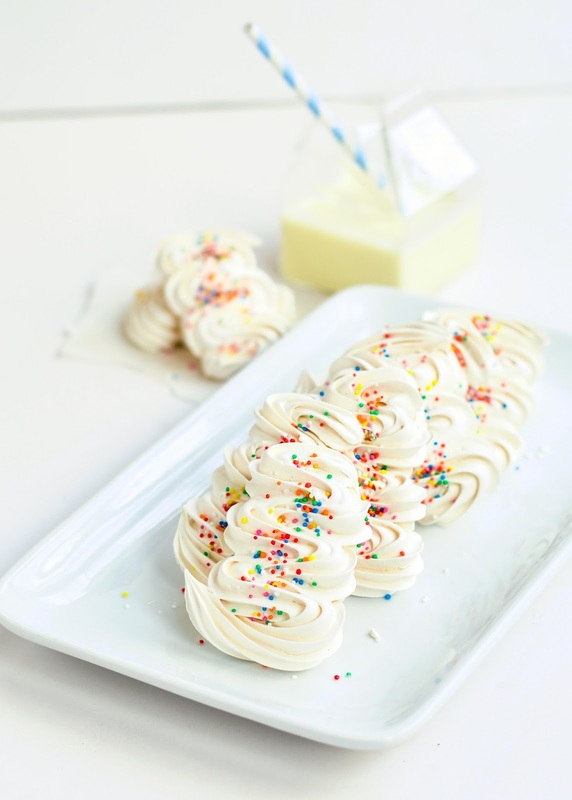 Hi, you have lovely photos and love those meringues! I couldn’t help but notice you’re from Australia too, and I’ve just been searching everywhere for those glass/plastic clear milk cartons. Mind telling me where you bought them from?? Thanks a TON!